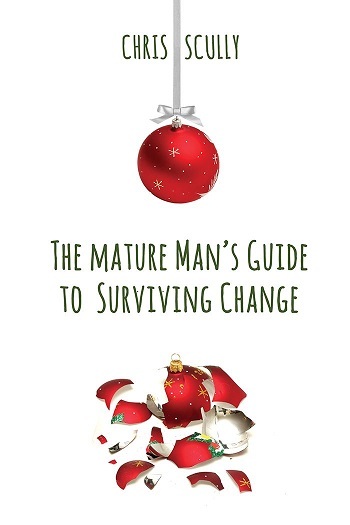 I thoroughly enjoyed The Mature Man’s Guide to Surviving Change. This holiday novelette made for an entertaining couple hours of reading as Joel comes to terms with the life changes he’s made since his best friend’s death, the feelings he has for Perry (his best friend’s husband), and his jealousy and insecurity when Perry begins receiving gifts from a secret admirer, especially after Perry announces that he’s ready to start dating again. Joel is a wonderful contradiction of a character. Normally confident in his love life, while being more passive in his career, Joel made a major change in his life when his best friend, Dale, died – he quit his prestigious position as an executive chef to start his own business. Now his professional confidence is bolstered while his personal confidence has flagged since he’s no longer interested in flings. Unfortunately for Joel, the object of his affection is off-limits in his mind. Not only is Perry his best friend’s widower, Joel is nothing like Dale and cannot imagine Perry being interested in him romantically. So, Joel takes comfort in the only role in Perry’s life he believes he can have – as a close friend. Fortunately for Perry (and the reader), Joel is forced to reexamine his place in Perry’s life when a secret admirer begins sending Perry gifts. Watching Joel accept that it’s okay for him to want more than friendship with Perry was sweet. Between Joel’s conversations with a former fling and another close friend, it’s easy to see that Dale’s death affected him greatly, causing him to grow up a bit and want more from his partner than just a quick tumble. I enjoyed watching the attention of others for Perry light a fire under Joel’s behind. The best part was when we learned who Perry’s secret admirer was. I didn’t see that coming and really enjoyed the twist. Scully’s The Mature Man’s Guide to Surviving Change is an enjoyable holiday read that’s a great reminder that we’re never too old for love. CHRIS SCULLY lives in Toronto, Canada. She grew up spinning romantic stories in her head and always dreamed of one day being a writer even though life had other plans. Her characters have accompanied her through career turns as a librarian and an IT professional, until finally, to escape the tedium of a corporate day job, she took a chance and began putting her daydreams down on paper in her spare time. She is an avid reader and tries to bring pieces of other genres and styles to her stories. While her head is crammed full of all the things she’d like to try writing, her focus is always on the characters first, and the happy endings they deserve. She describes her characters as authentic, ordinary people, faults and all—the kind of guy you might meet on the street or the one who might be your best friend. She currently divides her time between a mundane 9-5 cubicle job and a much more interesting fantasy life. Although keeping up with social media is sometimes a challenge, she does her best and loves to hear from readers. Reviewers on the Wicked Reads Review Team were provided a free copy of Stocking Stuffers: The Mature Man's Guide to Surviving Change by Chris Scully to read and review.